Welcome to the age of Antibiotic Resistance where one day soon a simple cut on your finger could kill you. This is not some scifi scenario but a very real threat where superbugs are not only increasingly common and deadly, but also unresponsive to the pharmaceuticals we have. “Far from being an apocalyptic fantasy,” an era of modern health care without antibiotics “is instead a very real possibility for the 21st century,” states the World Health Organization. For instance, 58,000 babies died last year in India because there was nothing they could take to combat their infections. During the Golden Age of Antibiotics (from 1940 through 1960), germs couldn’t catch up with the new variations. These new medications were virtual wonder drugs. But that was short-lived. Bacteria and other pathogens have always evolved so that they can resist the new drugs that medicine has used to combat them. Antibiotics have only existed since the 20th century, whereas bacteria have been around for millions of years. Antibiotics VS Bacteria? We lose. 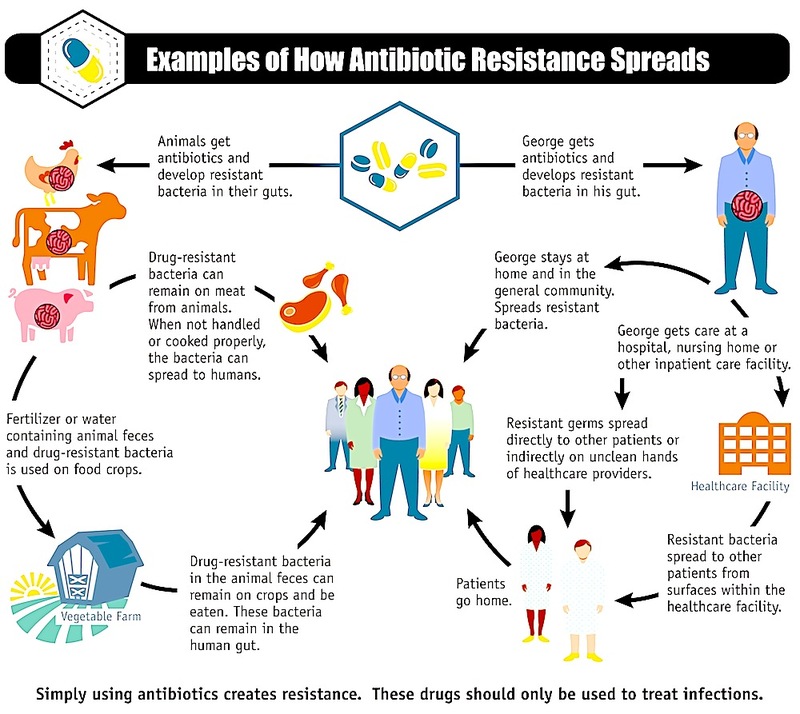 Centers for Disease Control and Prevention estimates that roughly two million Americans develop antibiotic-resistant infections each year, resulting in at least 23,000 deaths. And two more million fall ill. Antibiotic resistance costs more than $20 billion in direct health care costs in the U.S., with a lost productivity estimate of $35 billion on top of that. The UK Prime Minister addressed AR in December 2014 and Obama has finally responded with a 2016 budget proposal, allocating $1.2 billion toward initiatives to fight antibiotic resistance, including more than $300 million for improving antibiotic stewardship in both health care and agriculture. 1) Misuse and Abuse: Doctors prescribe antibioics like candy and often wrongly so. For instsance, they often prescribe them to treat viral diseases that can’t even be cured with bacteria-killing drugs. What’s up Doc? 2) Drugs in Meat: In the early 50s, the FDA approved their use in animal feed, based on studies showing they helped chickens, pigs, and livestock put on extra weight. In addition to making animals grow faster, they’re used preventatively to compensate for overcrowded and unsanitary conditions. 3) Food We Eat: AR is also spread via fertilizer or water-containing animal feces and drug resistance bacteria. This means it get on food crops. 4). Unregulated Usage: In places like Central America, you can walk into a pharmacy and ask for an antibiotic without a prescription. For instance, during my trip, a friend contracted Hep A (a virus) and bought some the penicillin antibiotic Amoxicillin. I warned him against it and even found evidence showing that this medication can ironically cause Hep A. Imagine having a pan-resistant infection with no effective treatment available? Avoid Triclosan and other antibacterial soaps that actually lend to resistance, they are not more effective then scrubbing for 30 seconds with regular soap and water. Read Dirty Clean Lies to learn more. Dont take an antibiotic unless you absolutely have to. Ask for shortest duration and follow as directed. After 16 years, I was able to cure my UTI for the first time ever without antibiotics. Trash your Neosporin and discover the ancient healing properties of silver instead. Researchers found that nearly half of the USA300 samples they studied grew unhampered by two of the antibiotics found in both Polysporin and Neosporin (bacitracin and neomycin), indicating that they were resistant to both drugs. Another USA300 sample was resistant to bacitracin, but susceptible to neomycin. Check out this infographic on Care2 about other ways AR spreads. Solution: Select Silver: “Ore” Else! Silver oxide is an ancient healing secret that was wiped off the medicinal map after antibiotics – specifically penicillin – were discovered in the early 20th century and patented by Big Pharma. Since you can’t patent silver in its natural form,the age of antibiotics buried the legend of silver oxide. A few important facts about 3rd Rock Rashblock which HoneyColony would like to rename, Silver Panacea. 3rd Rock Rashblock is in chelated oxidized form so is it not a heavy metal. 3rdRock is silver chelated, which means it’s more bio-available because it has the optimum particle size to tie to a wound or infected area. Chelated silver oxide kills all strains equally and does not lead to mutation or compromise your immune system like antibiotics. Thus far we’ve heard ad witnessed reports of 3rdRock: taming the itchiness of mosquito bites; healing a Scorpio’s sting; eradicating pimples, and improving a bad motorcycle-related burn.